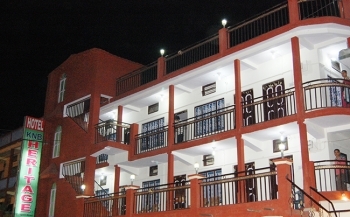 Hotel KNB Heritage is a budget hotel located in Uttarkashi town. The economy property is providing very comfortable accommodation for travellers, trekkers and pilgrims to Uttarkashi and Gangotri. The friendly staff and highly personalised service caters every guest to stay with ease in the hotel. The hotel is located near the taxi stand at centre place of Uttarkashi town. Famous sightseeing places in Uttarkashi such as Vishwanath temple, Bhairav Devta temple, Parshuram temple and Annapurna temple are situated at walking distance from the hotel. The hotel offer best budget 10 rooms to its guests categorize in Deluxe Double Bed room, Deluxe Four Bed room, Deluxe Single Bed room and Economy rooms. Each room has all basic amenities such as clean bed with linen, attach bathroom with running hot and cold water and Satellite cable TV. There is no dining option available in the hotel but guests can dine at nearby GMVN or private restaurants. Uttarkashi is well connected by road to Rishikesh (177 kms), Mussoorie (170 kms) and Dehradun (199 kms). Regular buses are available from Dehradun & Haridwar (200 kms) to Uttarkashi. One can take sharing taxi from Rispana Bridge Taxi Stand in Dehradun to reach Uttarkashi after 6 hrs road journey. By Rail : Dehradun and Rishikesh railway station are the nearest railway head to reach Uttarkashi town. Both the stations are well connected to metro cities of North & Central India. By Air : The Jolly Grant Airport is located in Dehradun and nearest one to reach Uttarkashi.